Reading Borough Council will not be able to accept representations made after Friday 26th January 2018.
on-going transition, and UN-Habitat, with the entire UN development system, has a potentially critical role in supporting countries to effectively implement this Agenda. becoming worse. Poverty, hunger, disease, vulnerability to disaster, violence, are all becoming increasingly prevalent in many urban areas. places become a disaster marked by inequality exclusion, inadequate basic service provision, humanitarian crises and growing civil strife. development. Equally important in this endeavour are the Paris Climate Change Agreement, the Sendai Framework for Disaster Risk Reduction and the Addis Ababa Action Agenda. Yet urban areas, with their growing majority of the global population, their concentration of both economic risk and potential, their vulnerability to climate-related disasters, and their relationships with surrounding areas, are not only relevant to realising this Agenda, they are central to its success, and the stage on which the SDGs will or will not be achieved. Most of the Goals necessarily have urban implications, and without significant attention to urban realities in all their manifestations and complexity, the ambitious objectives of the SDGs cannot be realised. When all the ice has melted, first I will be Warm and then I will be Cold. Stay up-to-date with the analysis and outcomes of Disaster Risk Reduction and International Law Symposium 2017 by our Reading blog posts. How to grapple with the increasing frequency and severity of a wide array of both ‘human-made’ and ‘natural’ disasters. Are disaster management services the main duty-bearers to roll out DRR? Break down legal fragment between DRR, Climate adaptation, the Tree proposal, Sendai framework, the SDGs, also between nuclear regulations. Land use and forestry proposal for 2021-2030 – Forest laws to reduce deforestation. Connect DRR and climate change, after New Zeeland 2010 Building code demolish or rescue. 2011 International convention from prevention of pollution from ships. Mexico mainstreamed DRR law in all sectors. France mayor sent to prison for ignoring DDR laws. Sectoral laws like Climate change adoption laws and development approvals important in rural and sub-urban areas. Linkage between environment laws and climate change laws. Legislation/Regulations Is it a Self form of disaster risk reduction DRR? Can monitoring DRR indicators alone identify (urban/rural) hazards and exercise disaster relief law of public response? Does climate legislation and regulation protect Who is an (urban/rural) disaster victim, healthy/sick people? PREVENTION at activities and measures to avoid existing and new disaster risks. MITIGATION de-licensing or minimizing of impact of hazardous events. PREPARDENESS capacity developed by governments responds and recover organisation, community or individuals to effectively anticipate respond to and recover from the impact of likely or imminent or current disasters. Duty is a conduct and not a result, to shall reduce risk of disaster and harm precaused thereby. Can the Sendai framework be enforced? Is there a will to extend the new international treaties within the domestic jurisdiction? States have a disaster law impact on human rights not only in their own territories. Also, often there is an extraterritorial disaster law impact – on people in the rest of the world. This project aims to provide a critical evaluation of the law and policy of whether and to what extent disaster law vs. human rights law is and should be applicable to states extraterritoriality. The highly developed industrialized nations’ responsibility to combat climate change is obvious and cannot be overestimated. Similar to the issue of sustainable consumption and production patterns, the rich countries need to become leading examples if the goal of combating climate change and its consequences is not to remain mere lip service. Effectively reducing CO2 and other greenhouse gas emissions is imperative in this regard. The data displayed in figures 13.1 and 13.2 show how far many OECD countries are still lagging behind compared to the respective benchmark countries of the sample. Figure 13.1 provides information on production-based CO2 emissions per capita. “Production-based” means that emissions refer to gross direct CO2 emissions from fossil fuel combustion, emitted within the national territory excluding bunkers, sinks, and indirect effects. In the fi ve leading countries, Mexico, Turkey, Sweden, Portugal, and Hungary, as well as in sixth-ranked Chile, production based CO2 emissions are below 5 tons per capita. These countries’ performances stand in stark contrast to the respective emission levels of countries placed at the bottom of the list, such as Canada, the United States, Australia, and Luxembourg. Here, CO2 emissions range from 15.3 (Canada) to 19.47 tons per capita (Luxembourg). The second snapshot indicator links emission levels to the size of a country’s economy, and refers to total greenhouse gas emissions per GDP. Greenhouse gas emissions include land use, land-use change, and forestry, and are measured in CO2 equivalents as a percentage of GDP (tons per million constant 2005 int. USD PPP). The findings are remarkable: While Sweden is by far the top-performing country with an amount of 66.75 tons, Estonia comes in last place with 680 tons – more than ten times as much as in the case of the leading country. Moreover, Sweden is the only country ranked among the top five on both indicators chosen here. 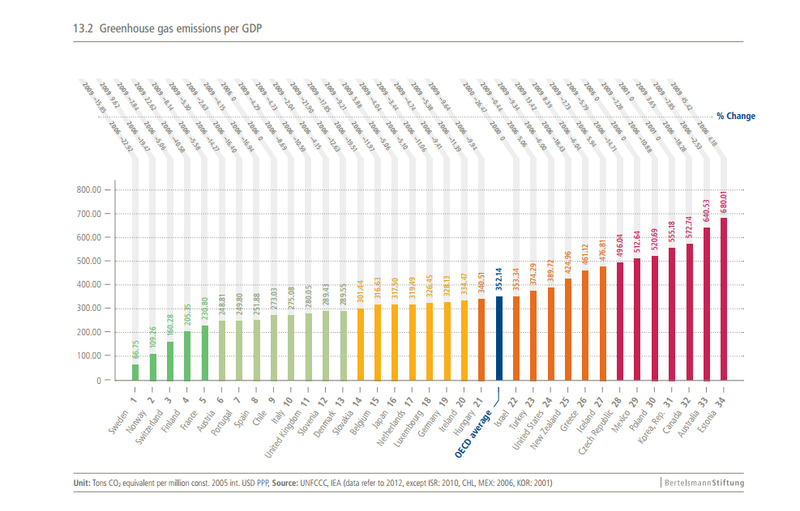 With regard to greenhouse gas emissions per GDP, Norway, Switzerland, Finland, and France follow in places two to five. 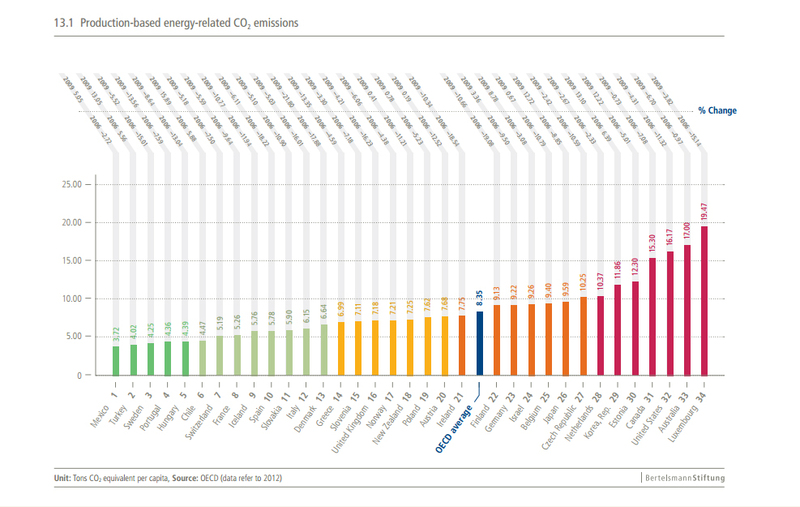 In fifth-ranked France, however, emissions are already nearly four times as high as in Sweden. At the negative end of the spectrum, Canada and Australia again find themselves in the bottom group. Australia’s greenhouse gas emissions per GDP amount to 641 tons, which means that the country ranks second to last on both indicators of goal 13. 3 May 2016: UN Member States, international organizations and stakeholders held a week-long session of Open-Ended Informal Consultative Meetings in preparation for the UN Conference on Housing and Sustainable Urban Development (Habitat III). The Meeting aimed to advance discusssions on the New Urban Agenda to be adopted at Habitat III, and to prioritize actions and identify transformative commitments to move towards sustainable cities. The Meetings convened at UN Headquarters in New York, US, from 25-29 April 2016.
the 2030 Agenda on Sustainable Development, including the Sustainable Development Goals (SDGs), particularly Goal 11 (Make cities and human settlements inclusive, safe, resilient and sustainable). The meeting was organized around: regional perspectives; transformative commitments for sustainable urban development; effective implementation; and how to enhance means of implementation (MOI). Panel discussions examined recommendations and outputs of the ten Habitat III Policy Units, which focus on: the right to the city and cities for all; socio-cultural urban framework; national urban policies; urban governance, capacity and institutional development; municipal finance and local fiscal systems; urban spatial strategies – land market and segregation; urban economic development strategies; urban ecology and resilience; urban services and technology; and housing policies. Panels took place on the outcomes of the seven Habitat III thematic meetings that have taken place as part of the preparatory process, which focused on: civic engagement; metropolitan areas; intermediate cities; sustainable energy and cities; financing urban development; public spaces; and informal settlements. Another session reviewed the outcomes of the Habitat III regional meeting. In the closing session, Clos stressed the importance of urbanization for sustainable development, noting that the understanding of development has changed, as well as that of the role of urbanization in promoting prosperity. Meeting Co-Chair Maryse Gautier, France, welcomed the engagement of all stakeholders and summarized key messages from the week, including that: the resource management system is necessary; urban development must take into account the protection and maintenance of cultural heritage to ensure inclusive cities; informal sectors must be taken into account during spatial planning; and finance must be further mobilized. Earlier in the month, the final regional meeting for Habitat III took place in Toluca, Mexico, from 18-20 April 2016, with a focus on priority issues for Latin America and the Caribbean (LAC). The meeting resulted in the Toluca Declaration, which will serve as input to the New Urban Agenda. The Toluca Declaration proposes that the following issues be addressed in the New Urban Agenda: urban and territorial planning; urban governance; adequate housing; water and sanitation; sustainable mobility; land management; and environment, climate change and resilience. The Declaration calls for a new generation of national urban policies built on a new urbanization paradigm that promotes accessibility, adequate housing, equity, security, mobility and cultural identity. It further identifies elements for implementation of the New Urban Agenda at the national and local levels, including: developing innovative models of multi-level governance; promoting institutional solidity, professionalism, transparency and accountability in urban management; establishing spaces for citizens to participate in urban development; promoting sub-national financing mechanisms; and using information technology and communications in public decision making. Relevant stakeholders come together in generous ‘Praha’ to participate in the European Habitat Conference within the framework of the United Nations Economic Commission for Europe (UNECE). It is one of five regional commissions of the United Nations, bringing together 56 member countries from across Europe, the Balkans, North America and a part of Asia “the Global North”. The focus of the conference was to debate urban solutions to the issues of housing estates and the need for municipal integration. In the process towards a #NewUrbanAgenda, Habitat III Europe Regional Meeting “European Habitat” discussed how to ensure access to decent, adequate, affordable and healthy housing for all, with due attention to reducing the impact of the housing sector on the environment. It addresses relevant current problems like urban poverty, demographic changes, climatic changes and risk of disasters, urban development and urban sprawl, coordination of urban development, and relevant use of technologies. The most significant event of global reach to be held this year in Prague has ended with the approval of the Prague Declaration. Resource efficiency and promoting sustainable consumption and production patterns are critical elements for cities to manage growth, increase resource productivity, and decouple economic growth from increased resource use and its environmental impact. Progress in technologies and the availability of data are rapidly changing our life and the way we organise it. Urban planners should adopt relevant technological innovations, which allow more effective use of available data. This requires educating and building the capacity of urban managers, decision-makers and inhabitants. Open and disaggregated data is a critical component in transparent and effective governance and also in the provision of efficient environmental and energy services in urban settings. Every effort must be made to keep shared data accessible to the public, while protecting the privacy of individuals. Cities should consider simple, interoperable, and comparable data markers and standards for data collection. Data should also be transparent and openly accessible to be exploited as a tool to increase the ownership and engagement of people. Technological and digital divide in urban planning and management has to be addressed. “We acknowledge also regional specific agreed charters and strategies like, among others, “The Geneva UN Charter on Sustainable Housing” and the “Strategy for Sustainable Housing and Land Management in the ECE region for the period 2014-2020”. To fight climate change and avoid more loss of land The New Urban Agenda need to define and protect our greenbelts in order to keep our cities rural fringe green, compact and resilient. Also to ensure that urban dwellers have access to countryside, with consequent educational and recreational opportunities; and to protect the unique character of rural communities that might otherwise be absorbed by expanding suburbs. Stress that: Sustainable and integrated urban development and its management are crucial to the safety and quality of life of our people. Public space and the buildings that surround and define it need to be socially, economically and environmentally sustainable. Social sustainability requires security, equity and justice; economic sustainability benefits from affordable capital and operating budgets; environmental sustainability addresses ecological and health issues. These include clean air, water and soil, green micro-climates and the mitigation and adaptation to the Urban Heat Island Effect and Climate Change. Effective use should be made of green technologies and systems. Architecture and urban design that is adaptable and appreciated is cared for and sustained for a longer time. Promote the knowledge transfer of good practices regarding the quality of green and public spaces, e.g. in devising layouts, ratios, spaces and built-open space and frontage ratios capable of reconciling socio-economic vitality and environmental quality with safety and pleasantness. “In order to prevent urban sprawl and strengthen the “multiple use of space” principle through effective land management. We also support climate change adaptation and mitigation measures and cities’ resilience to floods, heat waves and natural and man-made hazards. Cities have to be sustainable, without excluded zones; account must be taken of their residents. Development requires a clear strategy tied to a defined vision. Accessibility in all its aspects: accessibility of housing, public services, travel, and culture. Only those with daring visions can turn cities into good places for living. Only good housing can make a place good for living; whereas urban housing means not only a “shelter”, but a healthy and safe home. Liveable and functioning cities without excluded zones. I want no derelict and evacuated city centres. In the Czech Republic and many nations, one of the developmental obstacles is frequently fragmented competences. This is an aspect that has to be addressed and changed. Urban planning and design must be centred around living in the cities. 16-18 March 2016: Three days of urban discussions in Prague with almost 4,000 experts worldwide on the future development of cities and municipalities. The UN Habitat Conference, organized by the Ministry for Regional Development, headed by the Minister Karla Šlechtová ended on Friday, 18 March 2016 with approval for the #PragueDeclaration. The document will have a direct impact on UN policy in the field of sustainable development and be part of the roadmap leading up to Habitat III in Quito. The Czech Republic and organisers have not only mastered the difficult preparation and organisation of the conference, but they also carry away a few key messages for further work and development in the area. The Declaration is based on four principles: Innovative and productive cities, Green, compact, resource-efficient and versatile (resilient) cities, Inclusive and safe cities, Good urban governance. Emphasis is put primarily on support to proper planning and management to be conducted in cooperation with all levels of governance and communities; a unified approach is vital in the effort to maximise the potential of cities, social cohesion and access to services; affordability of housing as a key factor of quality of life is one of the main features of viable cities; urban development planning must involve the effort to minimise impacts on the environment and to enhance economic, social and environmental sustainability. We are facing various challenges relating to housing and sustainable urban development in the regions: urban poverty, demographic changes, #climate changes and based on science disaster risk reduction #DRR, urban development and mandated growth, coordination of urban development, use of relevant technologies. Key directions from Prague to Quito: supporting cities by strengthening their capacity for innovation including social innovations and job creation, supporting optimal use of resources, equal access to affordable housing and services, eliminating poverty and exclusion, providing affordable, safe, inclusive and high-quality public space and safe transport, healthy financial management in municipalities, ensuring sustainable sources of financing, reinforcing the dialogue between various levels of government and relevant actors. It was attended by nearly 4,000 thousand experts from around the world. During the Conference a total of 96 separate official events and dozens of bilateral negotiations were conducted. In total there were more than 300 hours of expert discussions. More than 50 experts took the floor. Significantly the conference also involved the Czech representatives, in the main program and accompanying activities. The main outcome of the Conference is the Prague Declaration, the final version of which has been worked on by the international Advisory Board and with the participation of Minister of Regional Development Ms. Karla Šlechtová. The Conference was held on an area of more than 42,000 sq-m2 in the Prague Congress Centre. In addition to the PCC, more places in Prague hosted the Conference accompanying activities. An organisation team of more than 150 people looked after the organisation of the Conference. More than 11,000 meters of cabling where installed in the Prague Congress Centre in order to provide technical setting to the Conference. About 100 model works created by students were exposed in the Congress Centre – many of them 3D models of planned buildings.